The Northern Powerhouse Independent Economic Review, which was commissioned by TfN on behalf of northern partners, identified four prime capabilities which could drive transformational growth in the North’s economy. 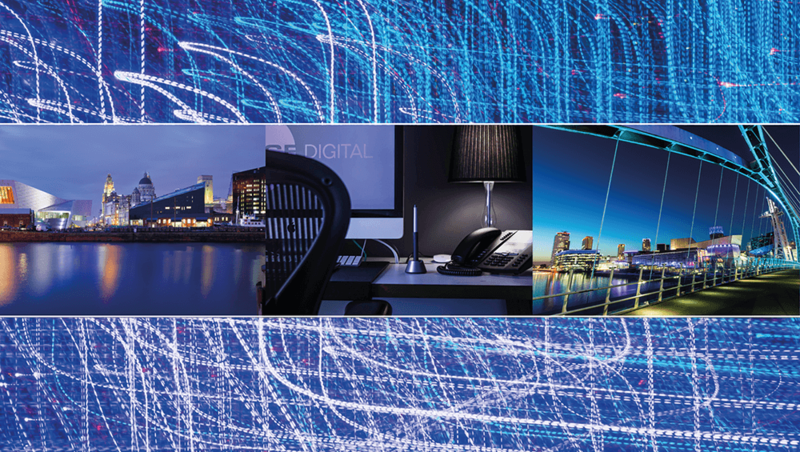 One of these four capabilities is Digital, so we decided to sit down with three Northern influencers in one of the fastest moving business sectors to ask their views on real-world connectivity. Here’s what they had to say. Lee Omar: I’m the CEO of Red Ninja based in the Baltic Triangle in Liverpool and we make digital products to help people in healthcare and transport. Phil Blything: I’m the Managing Director of Glow New Media in Liverpool, which is a transport systems innovator. We make mobile applications and websites and more often than not we will create the structures that allow those things to work together – and increasingly we are doing that for transport operators. Matthew Nelson: I am Managing Director, Head of Production, at Space Digital in Manchester. We are a production company but also a visual effects company so we will make films for commercial clients – from people like Mercedes to The Open University and we will do visual effects for dramas; things like Doctor Who, Happy Valley… it’s diverse! Are you a regular transport user and how does it affect your business? Lee Omar: I travel a lot – thousands of miles a week using mainly planes and trains, I don’t have a car, and I ride a bike every day. We go to London a lot and it seems to have the hub and spoke model sorted; you can go into London on a fast train and go out to Cambridge, for example, on another fast train but you can’t do this elsewhere in the country. To do business across the north is not as efficient as across the South East. I recently almost missed out on an opportunity because he was based in North Yorkshire and I couldn’t get there within a decent timeframe but luckily he ended up being in the area. Phil Blything: We pivot between Liverpool and London and we work with customers from Norway to Australia. I drive sometimes but the train is the big thing for London in particular. Recent trips to cities in the North include Glasgow and Newcastle – Glasgow is easier with the train, Newcastle isn’t. For four months of last year, I was in another country – around 40% of all of our income comes from outside the UK. Cheap, affordable, reliable transport has enabled us to sustain our business inside and outside of our city and country. Matthew Nelson: We usually go on the road to see clients with the exceptions of possibly a train to London and flying when we go abroad – we have a lot of equipment to get to places but we generally hire that in. For our business, public transport is important though, particularly the tram system in Manchester which connects us and Media City with the wider network. Do you think that because of digital technology and the ability to work remotely, that transport is less important? Lee Omar: I think digital technology has enabled us to have a more flexible workforce but there will be plenty of times when we need to be face to face with people. If you try running a business without the face to face interaction, I think your business will fail. Phil Blything: With our current setup, all of my email documents are in the cloud so I can pretty much sit down at any online machine and have most of my office with me but for me, face to face meetings are one of the many things that technology doesn’t replace. Matthew Nelson: Technology has definitely enabled us to work efficiently but we tend to bring everyone into the office. I personally like to be in – when something goes wrong or needs sorting quickly, you need to be here. Do you see any changes in your industry now or in your future that will affect the way you work or the work you do? expensive to use but tomorrow it’ll be cheap and ubiquitous. Phil Blything: Transport is really important, currently there is a combination of problems with capacity and efficiency, across all of the main transport infrastructure and modes. It’s not often you add a new piece of infrastructure – we’re all looking forward to new infrastructure but interim, we need to make efficiency gains and I see these as being made by software systems; that’s something we’re focused on pretty tightly right now. Matthew Nelson: Technology is always moving forward; I think virtual reality (VR) will take off, and I think gaming will be the real “thing” – we’ve invested in hardware and software to do more VR. People are also now shooting at 4K and soon they’ll be shooting at 6K and 8K. What is the importance of location to your business? Lee Omar: My experience of working and playing in the Baltic triangle in Liverpool is very positive. In the first couple of years, we were reliant on collaboration – we simply wouldn’t have been able to do the jobs that we did, and got a good reputation for, without collaborating. A lot of the staff we get now said, they wanted to get into this, “Baltic Triangle thing”, making it easier to attract talent. Phil Blything: Liverpool has attempted to position itself as a digital hub for quite a long time and it has done well within the gaming industry, growing the sector and attracting talent. Unfortunately, the games industry isn’t significantly around anymore. I think Liverpool has some fantastic digital and creative businesses but I think it needs a lot more. Matthew Nelson: Manchester is a great place to do business, particularly at Media City, our clients like coming here, it feels like it’s a place where media ‘happens’. We’ve benefited from the location and we do work with people in Manchester – Red Productions are very good to us and they do dramas from ‘Happy Valley’ to ‘Last Tango in Halifax’. We did ‘Dragons’ Den’ titles which were shot in Manchester and we have done work with Children’s BBC dramas in the past but we rely on our other contacts really. How do you see the North of England’s economic strategy moving forward? Lee Omar: I am thankful for the fact that people are now talking about the North and I think it’s up to the people of the North; its businesses and leaders to grab hold of it and shape it themselves. Phil Blything: If the 15 million people of the North are to come together to act as the economic counterweight to the South East, you have to get them pulling in the same direction. One of the most important things to my mind that has happened, is the significant relocation of large bits of the BBC to Salford, adding economic gravitas. Matthew Nelson: There seems to have been a lot of money invested in Manchester but truth be told, London is always going to be the centre. The work we get from Media City probably pays about 20% of what we do and the other work we get, is from other areas outside of Manchester. The High Speed Network with London, HS2, do you think that will have any effect on your work? Lee Omar: I’d be more interested in the journey to London not costing me £300 to make a 9 o’clock meeting. If you fixed that, that would grow the bottom line of a business around here. Phil Blything: We don’t have it yet and until it’s available, it’s very difficult to comment what the real change will be. As I understand, it’s about capacity and I think there will be benefits to it arriving in the North West. We need to go further than HS2, and look at East-West connectivity in the North. Matthew Nelson: I don’t know actually – the train time to London is fine but pricing and quality, they seem to be more of an issue.